Apple’s Logic Pro music production software has become a huge hit within the realm of music creation. Finding the perfect MIDI keyboard controller is an important task and investment — one we feel should be taken seriously. We’re huge MIDI keyboard controller fans and have done a lot of research on this topic, especially because of how powerful we think Logic Pro really is. 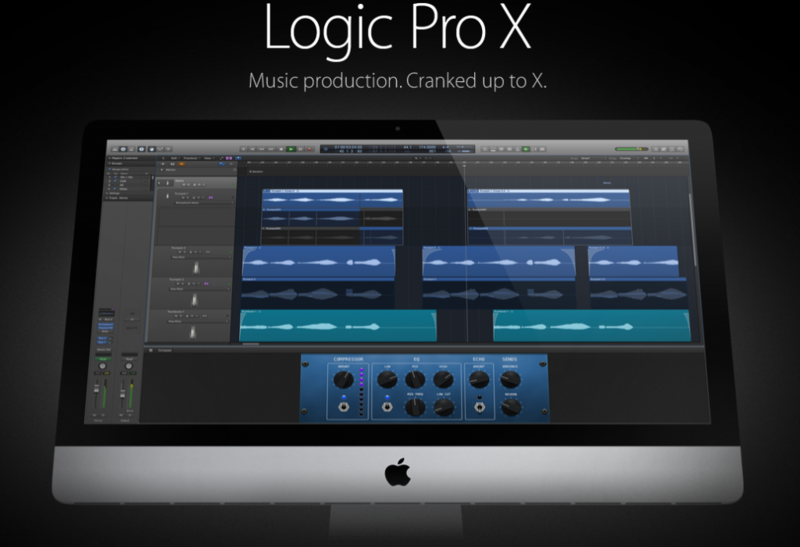 Next to Ableton or Pro Tools, Logic Pro is without a doubt one of the best music making production software available. It was one of our favorites in our best music production software article. Here’s what we found in terms of a controller for the DAW. Will you be using a MIDI keyboard that also acts as a control surface? (Knobs, buttons, displays to help you select parameters for editing/selecting specific tracks. Basically controlling your software from the MIDI keyboard itself). What kind of keys do you want the MIDI keyboard to be? (Synth action, semi-weighted, weighted, etc). Do you want pads on your MIDI controller? 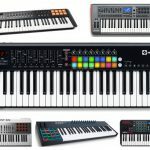 Is the MIDI keyboard controller you’re looking at in your budget? Novation vs. M-Audio? Any Akai fans out there? The usual debate about MIDI keyboard controllers for Logic Pro is between Novation and M-Audio models. If you’ve researched or browsed the forums at all, you’ll see a “which one is better?” thread nearly weekly. We’ve also seen Akai mentioned in the discussions so we’ve decided to analyze them as well. First of all, mapping features aren’t as easy as most keyboards claim. One of the most bitter sweet features of Logic Pro is the power you have of control, but in order to do so, you need to learn how to do it properly. Your best bet is hooking up the sounds manually (as we do), but if you’re able to get the mapping features of some keyboards correct, that is a huge plus. So our advice is to not let the automapping software of the Novation MIDI keyboard controllers you’re looking at sell you for a particular model. Some have complained about this, but Novation paid attention and improved this in their newer MIDI keyboard models. However, the Axiom’s mapping is said to really speed up this process with HyperControl, so we took that into consideration as well (particularly the Axiom Pro models, but those are pretty damn expensive). We then have Novation advocates claiming that the Axiom keys aren’t up-to-par and feel ‘flimsy and cheap’. The entire builds of M-Audio keyboards have also been stated to be just flat out cheap. In our opinion, that is one of the biggest factors of a MIDI keyboard and/or controller. So M-Audio loses there. The typical trend in comparisons tend to be sacrificing Novation’s mapping vs. the Axiom’s key and knob ‘plastic flimsy’ make. But what about Akai? Any love there? 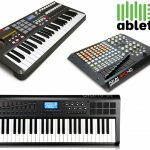 Although we are huge fans of Akai MIDI keyboard controllers, a lot of users around the Logic Pro forums have complained about the make of them. You’ve also got Arturia or Alesis, but they just haven’t gotten the right amount of reviews for us to take them into consideration. 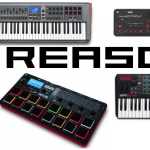 We narrowed our search down to the M-Audio Axiom Pro 49, Novation Sl MkII 49, Novation Impulse 49 and Akai MPK249. Here’s what we found. Our verdict was a close one, but we stuck with the Novation Impulse for a few different reasons. First of all, it is a relatively newer keyboard and they’ve seemed to work some kinks out with their automapping software. Their keys as well as overall build is also extremely polished, giving us a great feel with semi-weighted and aftertouch. Great for an overall feel in terms of playing both live and at your production setup. The make of the knobs and faders have been rated pretty highly as well. The Novation Impulse 49 features their brand new version of Automap 4 software, which has been stated by numerous users to work well with Logic Pro, specifically Logic Pro X. It will take some learning how to use, but once you do so, you’re good to go. You’ve also got the combination of multi-function drum pads to be able to play them naturally (a huge plus for us, especially live). With the pads you can also warp arpeggios and roll beats. Lastly, and although we’re all Logic Pro users here, it does come with Ableton Live Lite if you feel like messing around with it. Novation’s bass synth and loopmaster sample pack is also included. It is also USB powered which is a plus. As stated above, the Novation Impulse 49 has semi-weighted keys with aftertouch. This is typically stated to be the best make of keys in the business, but if you’re picky and an experienced player, you may want something different. However, for the average user, this is the key make you’ll want. You’ve also got the assignable aftertouch which is stated to help you feel like you’re actually playing an instrument as opposed to M-Audio’s more plastic, synth action-type of keys. The aftertouch helps with musical expression and gives you a more natural sound. Great reviews in terms of overall build with the Impulse. Many people have said it is better than the Akai MPK249’s keys. The Impulse has 8 knobs, 9 faders and buttons, as well as an LCD screen for a solid control surface build. As far as capabilities go for controlling your software, this is basically all you need. It has the essentials — control your mixer, transport controls, plug-ins, VST’s, and effects well. We can’t tell you how many people had complained about Novation’s automapping software when they first came out with the original Sl MkII MIDI keyboard controllers. The new Automap 4 works very well with Logic Pro, as backed up by many users around the net. The retail price could be a bit daunting (we’ve seen it rather cheaper on Amazon), but try to remember you’re investing in pretty much the most important piece of gear for your studio. Especially with Logic Pro, you need a MIDI keyboard controller that works. If you’re looking to save some money, you can also try a different key count: they have the Novation Impulse 25 at about $100 cheaper, or if you need a higher count, try the Novation Impulse 61. Here’s a cool video of the Impulse in action. If you want to save some money for a controller (perhaps with no pads, different software bundle, etc.) check out the list below. Below are some other options you may want to consider for your Logic mapping adventures. We’ve included controllers with all keys (most with pads), but if you want a device that is only pads, be sure to check out our best MIDI pad controller article. 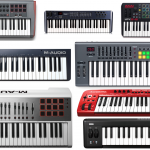 Also be sure to check out our top 10 best MIDI keyboards for some more choices. Let us know which one you pick in the comments! I have a friend who composes trailers for a living and he uses Logic Pro with a 66-key MIDI controller with no pads or extra funk. He keeps it simple with only the keys and doesn’t like to use faders, knobs or even pads for his type of music and maps everything via the DAW controls of the software. If you want to save some money and grab a controller that’s only keys and nothing too fancy, we recommend this controller. It also comes as the Keystation mini 32 key or if you want a better count, the Keystation 61 for a few more bucks, of course. This is a great budget controller as it is one of the cheapest in the market in terms of pad incorporation and software bundles. 12 assignable knobs with 36 assignable buttons, not to mention the pads are RGB backlit to give your studio that nice little touch of pizzazz. Alesis’ first shot at a high-quality MIDI keyboard wasn’t too bad afterall. The keys are semi-weighted with aftertouch, so don’t let the price fool you on its overall quality and stability. 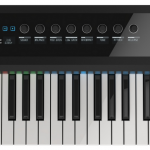 It’s also available in the 25-key, the Alesis VI25 as well as 61-key, the Alesis VI61 keyboard. The price increases about $80 each model. Read our full review of the Alesis VI49 MIDI keyboard here. This also made our best 49-key MIDI keyboard article. The AIR has gotten some great reviews, especially when it comes to mapping with Logic. The keys are very nice feeling and the pads are a bit smaller than others such as Akai or Novation but they do the trick. The mod and pitch wheels are pluses, not to mention a decent software bundle coming along with it. I’d take a look at this since it’s a bit cheaper than our top pick. We’re huge fans of Akai and this barely missed the cut in terms of best midi keyboard controller for Logic. The only reason is pretty much the price; however, if you want to spend that few extra bucks, you’ll be getting an overall better build/make of keys/pads with this one. The software bundle is a bit different as it comes with Ableton Live if you ever want to check that software out. It also has a few VST’s included that sound really good. 16 drum pads with 4 banks available, as well as 8 encoders, faders and knobs. A very solid controller to check out if you have the budget. 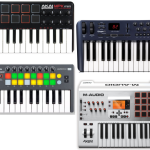 The MPK2 made it in our top 10 best MIDI keyboard controllers article. Read our full review of the MPK249 MIDI keyboard here.